It might look cute and cuddly but it’s as deadly as any other weapon. As a form of protest against assault weapons bans in the US, a dude from California decided to “alleviate the fears of (his) fellow citizens and gun-banning legislators” and created a legal AR-15 rifle for his wife. 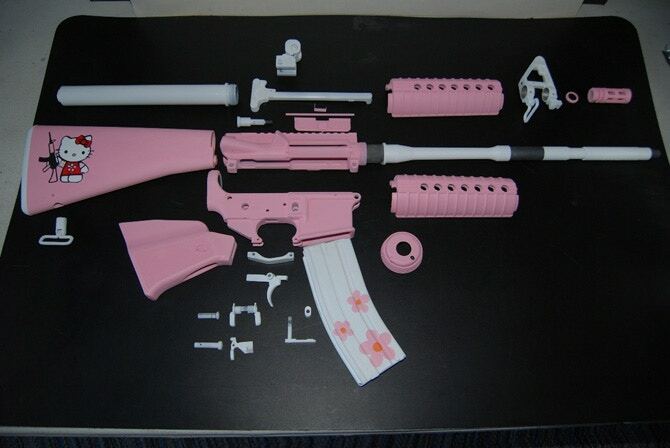 He painted all the parts in harmless pink, added a twisted logo of Hello Kitty holding a rifle and some flowers. This was back in 2006 and it created a lot of controversy, with some people blaming its creator of trying to portray deadly weapons as harmless and others asking where they could buy one. As somebody who hates guns and thinks they should be banned for all civilians, I can’t say I like this “toy” and I have to say I never thought men in the US give guns as presents to their better-halves. The gun is another, more recent example of evil black or silver turned cuddly pink.